PEDCO Members, Sign up today for the 30th Anniversary Golf Tournament in the beautiful mountains of South Fork, Colorado. This tournament is a great opportunity for members networking & getting in a couple rounds of golf too. Includes transportation to Rio Grande Golf Club & Resort, two rounds of golf with cart, all meals, overnight accommodations, hospitality suite, goodie-bag, and entertainment. Supporting our mission to attract, retain, and expand primary jobs. PUEBLO – CR Minerals is a leading worldwide producer of high-quality pumice products, based in New Mexico. They have a range of applications including an additive in cement for stone veneer, concrete block, landscape rock and other uses in the construction industry. The expansion into the Colorado market brings a new product which mixes a fly ash product with their pumice (from their mine in New Mexico), which makes cement last longer in the ready mix process. CR Minerals will be located at the St. Charles Industrial Park. PUEBLO – Next week, Pueblo Economic Development Corporation (PEDCO), along with the Colorado Economic Development Council of Colorado (EDCC) and the State of Colorado will celebrate Economic Development Week, with seven days of national recognition of economic developers who generate growth, create better jobs for residents and facilitate an improved quality of life. Economic Development Week is an event created by the International Economic Development Council (IEDC) in 2016 to celebrate achievements within the economic development profession. The IEDC council is the largest professional membership organization for economic development. All week, PEDCO will be highlighting Economic Development Week on our website and social media. Be sure to check out our daily posts on Facebook and Twitter to see how we are commemorating Economic Development Week and celebrating the great work economic developers do in Colorado. 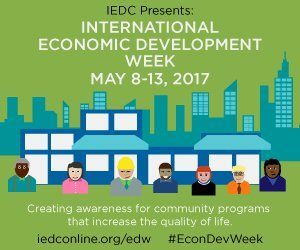 Follow the Economic Development Week Conversation at #econdevweek or #edw2017. Visit www.choosecolorado.com for updates about economic development activities at the state. 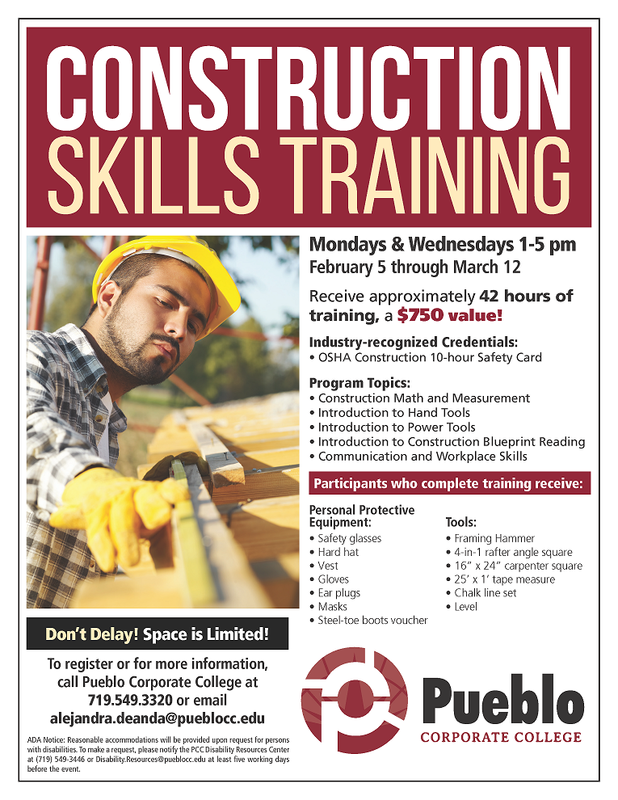 Pueblo’s job recruiters are getting busier in their own backyard. This week, leaders of the Pueblo Economic Development Corp. gave more details about the pro-Pueblo television commercial set to air in the Denver market. Also, they reiterated their wish to forge closer ties with economic development leaders in Colorado Springs in order to better promote Southern Colorado as a regional draw for employers. Until recently, Southern Colorado lagged behind Northern Colorado in job growth since the 2007-09 U.S. recession. The comments came during PEDCO’s quarterly luncheon meeting Wednesday at the Sangre de Cristo Arts and Conference Center. About 75 members and visitors attended. Among those in attendance was Dirk Draper, president of the Colorado Springs Chamber and EDC. In Colorado Springs, the group serves the combined functions as the Greater Pueblo Chamber of Commerce and PEDCO. EDC stands for Economic Development Corporation. Brian Moore, the 2017 chair of PEDCO and the chief executive of St. Mary-Corwin Medical Center, said the TV ad to air in Denver is nearly finished and copies will be sent to PEDCO members via email, he said. “The intent is not to poach from within our own state but it is to keep some of our surrounding states from poaching Colorado businesses,” said Moore, who announced production of the TV commercial earlier this year. He cited an example of a Denver outdoor recreation manufacturer that moved out of state and said later that it was not fully aware of the relocation incentives and infrastructure offerings in Pueblo. 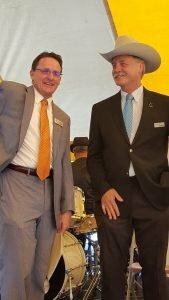 “It’s with that intent, really, that we go to our larger neighbor to the north with a message about business opportunity in Pueblo,” he said. Also, a number of railroad-dependent and other businesses in Denver are exploring moves to make room for public infrastructure projects like the Interstate 70 widening and National Western Stock Show expansion, PEDCO leaders note. The television commercial also serves as a follow-up to the full-page advertisement PEDCO ran last year in industry publication Site Selector magazine, Moore said. It also ties in with the new regional jobs creation push sought by Pueblo and Colorado Springs, which also advertised in the publication, he said. Pueblo and Colorado Springs residents “live regionally. … And when we are able to speak to the regionality, that strengthens our ability as Pueblo to land successful recruits. And where we can have a joint message, I think that really benefits the region,” Moore said. The Greater Pueblo Chamber of Commerce has long participated in regional economic development meetings and programs with Colorado Springs, including partnering on initiatives to protect jobs at Fort Carson. The TV ad to air in Denver will include footage showing Pueblo’s business infrastructure and also amenities such as Lake Pueblo. Moore, giving his first address since his election as chair, also spoke about the challenges of economic development and his high regard for the work of PEDCO, a mostly volunteer, dues-funded group open to the public. Jeff Shaw, president of PEDCO, offered a brief update on job prospects, saying the city continues to hold talks with various companies offering a combined 2,000-plus jobs. He also noted Express Scripts’ decision to close its 300-worker Pueblo call center, announced earlier in the day. “It really emphasizes what we do and why it’s so important and how aggressive we have to be,” he said. Shaw also gave a detailed report on PEDCO’s other operating plans for the year, including its new strategy of assigning members to cluster groups to research prospects in specific industries. The clusters align with PEDCO’s targeted industries of aerospace, rail, recreation and hemp. Also, he noted construction recently was completed on Pueblo’s latest shell manufacturing building, built near the pewag Traction Chain plant along I-25 in south Pueblo. Pueblo City Council approved funding for the project from the city’s half-cent fund for economic development, citing the dwindling supply of available industrial buildings in the area. PUEBLO – Big R, the largest farm, ranch, and retail chain in Colorado will expand its distribution warehouse and facilities in Pueblo, CO. Big R, founded in 1962 in the towns of Lamar and La Junta, began as a small family owned and operated business. From the inception, Big R has been the dominant farm, ranch, and home retail chain in the Arkansas Valley of Colorado. Big R has grown from 25 employees to 600 employees with 25 stores. Big R’s distribution warehouse and facilities in Pueblo currently employ 70 employees. 33 new full-time jobs to be in place by January 1, 2020. Average wage of $64,315 including benefits. 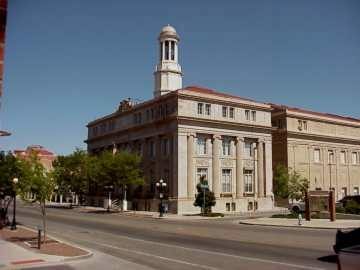 $6,856,000 loan from the City of Pueblo’s half-cent fund for economic development (contingent on approval from the Pueblo City Council) payable with interest over 10 years. PUEBLO – Vestas, the world’s leader in wind energy will expand its manufacturing facility in Pueblo, CO. Founded in 1898 as a blacksmith shop in western Denmark, Vestas started producing wind turbines in 1979, and have since gained a market-leading position with 76 GW of installed wind power and more than 63 GW under service globally. Vestas has been manufacturing turbine towers in Pueblo, CO since 2009. The facility in Pueblo is the largest tower manufacturing facility in the world.